There were lots of pragmatic decisions made here. 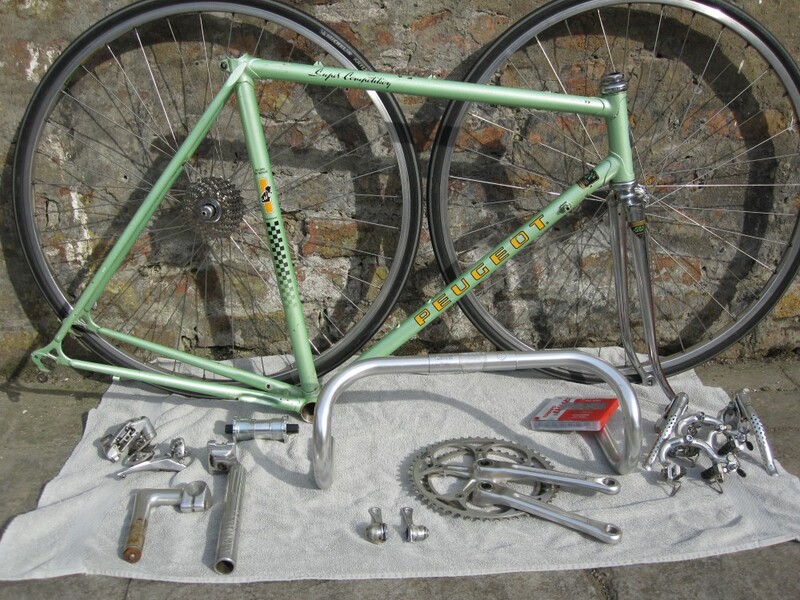 As stated in "5: Principles of my restoration", I had intended using as many Campagnolo components as possible. 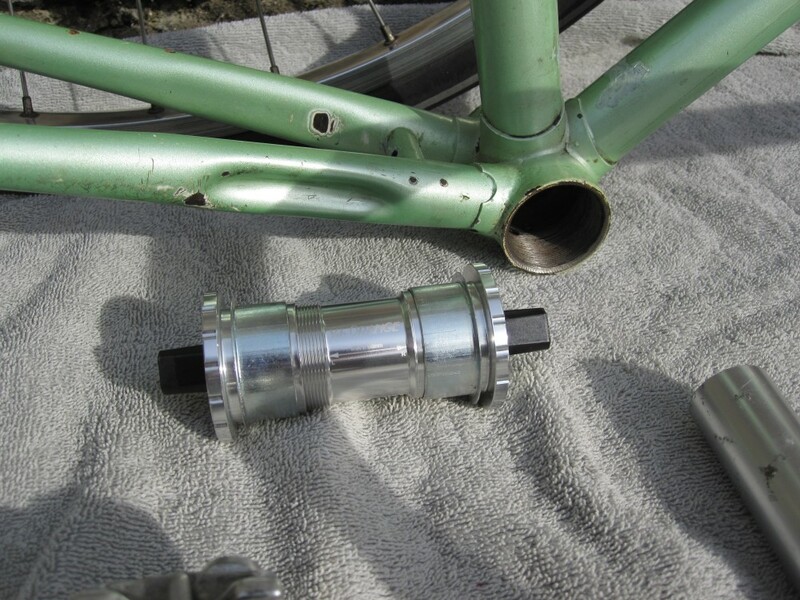 The requirements/fit of my chosen bottom bracket solution started the shift from this principle, then the price of Campag bits on eBay finally put paid to this principle completely. I did manage some French components (another principle that I started with). 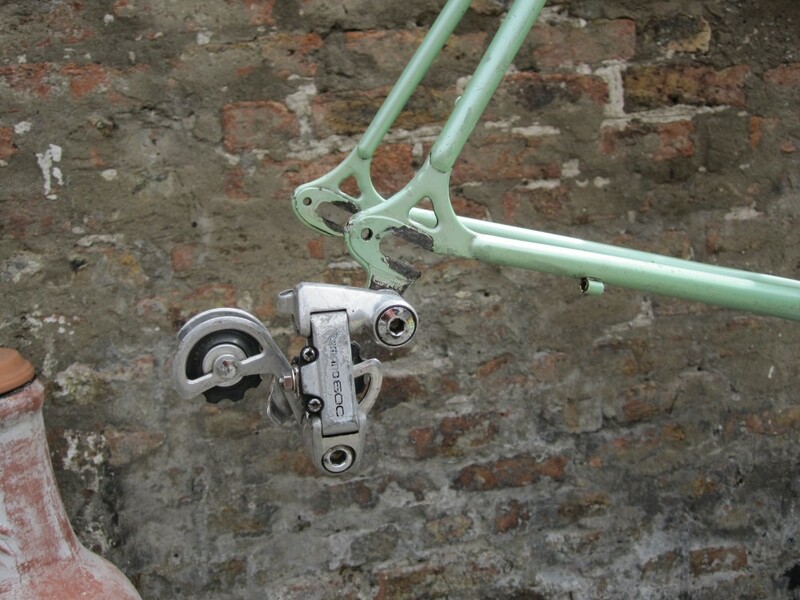 And along the way I liked the look of Shimano's 600 Arabesque parts so focussed on those a bit. 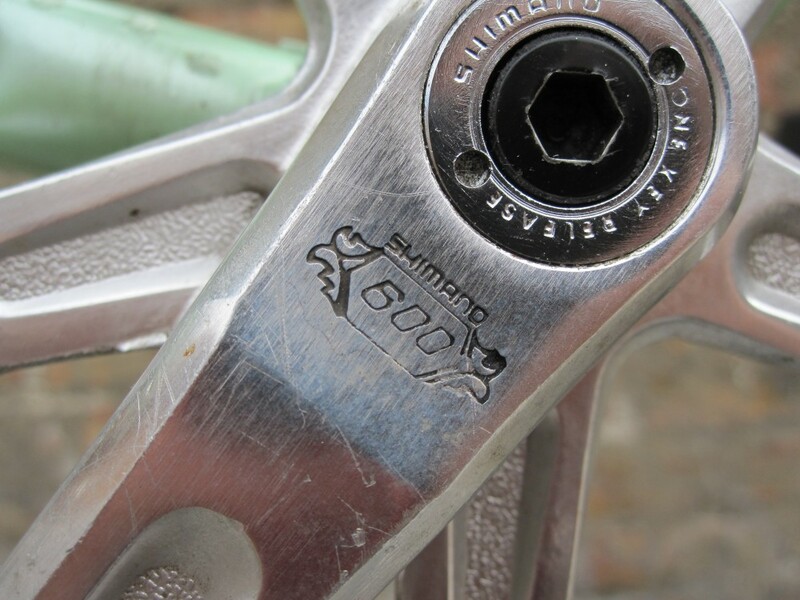 I also stuck with some other Shimano 600 as it was period correct and looked good. 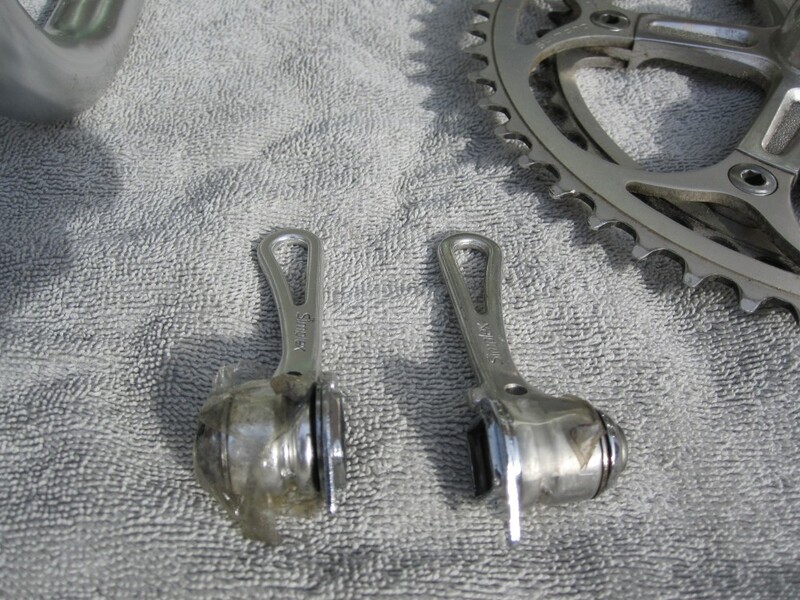 For a while I attempted to purchase a complete groupset from eBay, but these usually spiralled up in cost at the auction ending minutes/seconds, also in the groupsets there always seemed to be a few components which were poor (scruffy, rusty etc), so if the crankset was beautiful, the brake callipers might be showing some rust on the bolts, and vice versa. Thereafter I bought components individually, even though this increased the overall total postage cost (a not insignificant cost), but it allowed me to focus on good, clean, components. Bottom Bracket : New Velo Orange Grand Cru Threadless 115mm (comes in JIS fit only which forced me along a non-Campagnolo route for the chainset). 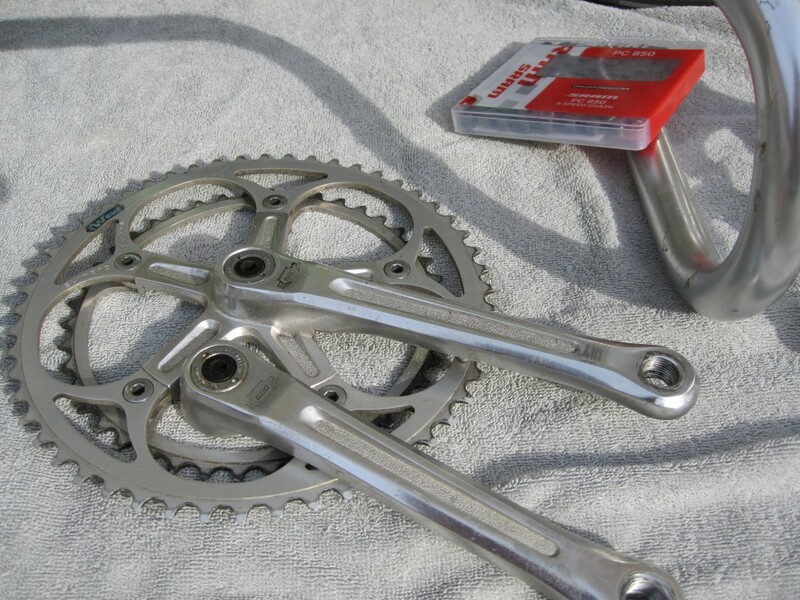 Chainset : Shimano 600 Arabesque (from 1980 & 1979 stamped on each crank) with 52/42 chainrings. 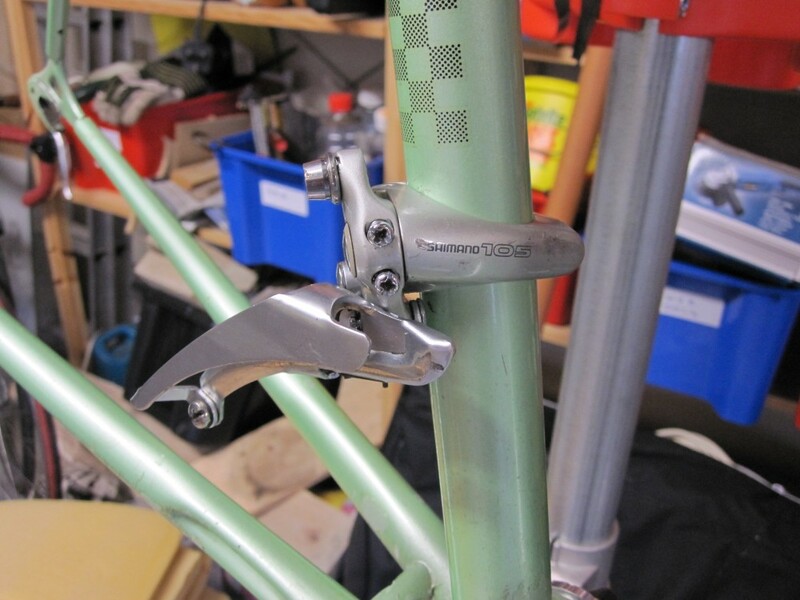 Brakeset : Shimano 600 Arabesque (from 1978 to 1984 period). 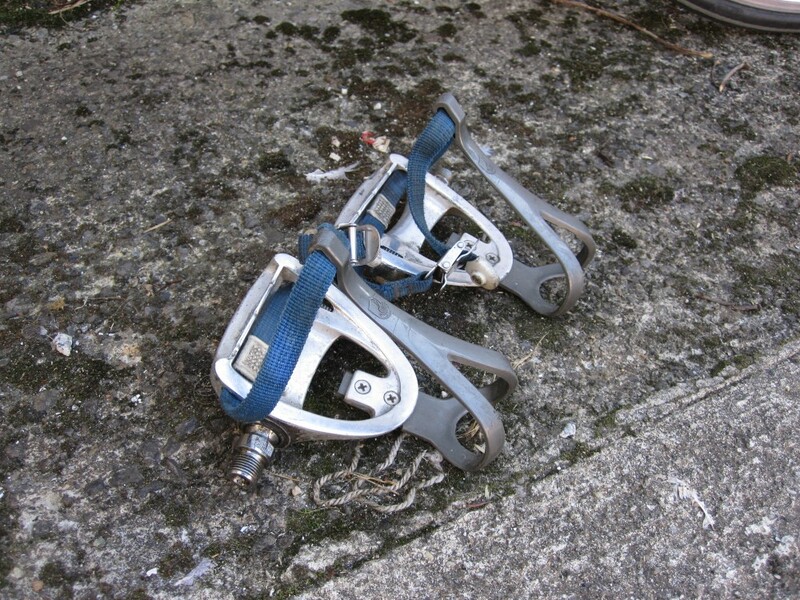 The callipers were long reach, max 57mm, and attached with a nut - not recessed allen key. 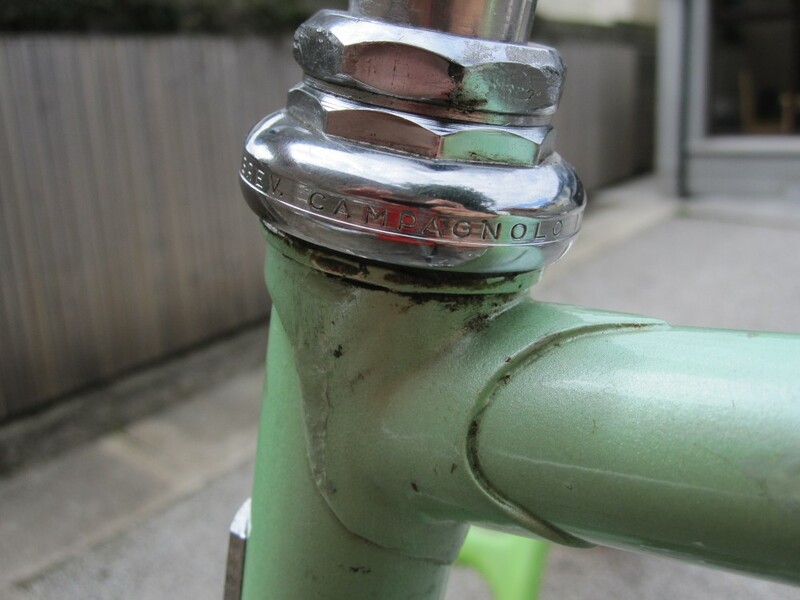 Wheelset : Shimano 600 Tricolore (from 1988 to 1992 period). Hub Front : HB-6400 with 100mm spacing; Hub Rear : FH-6401 with 126mm spacing and 7 speed Uniglide/Hyperglide compatible. Both rims are Mavic MA2. These fitted my period requirements, but as mine are HG compatible, I suspect they were built towards the end of the 1988-1992 period. 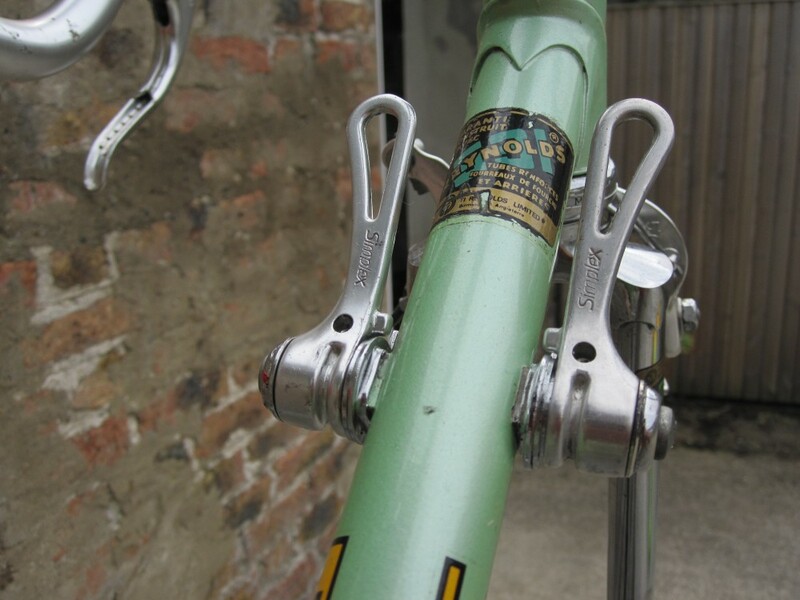 Gear Levers : Simplex (French and from 1980s) SLJ Retro Friction. 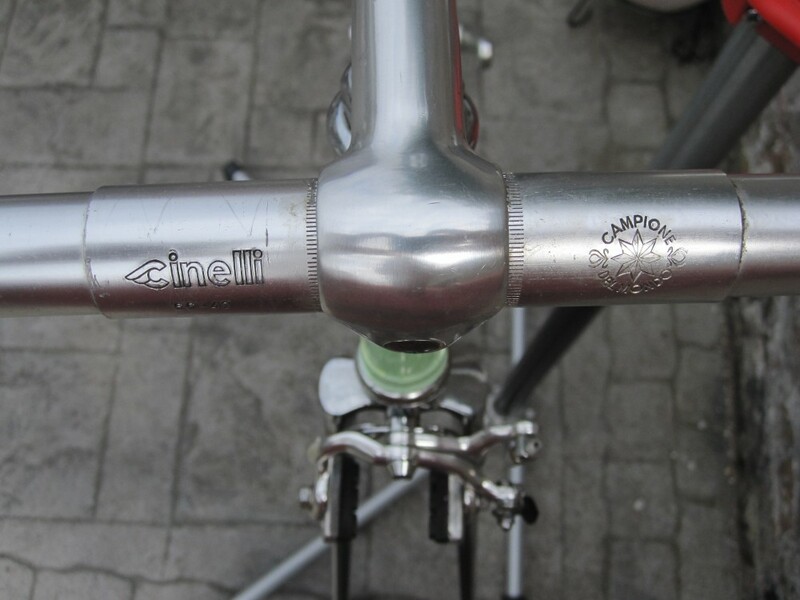 Handlebars : Cinelli 66-42 "Campione del Mondo". 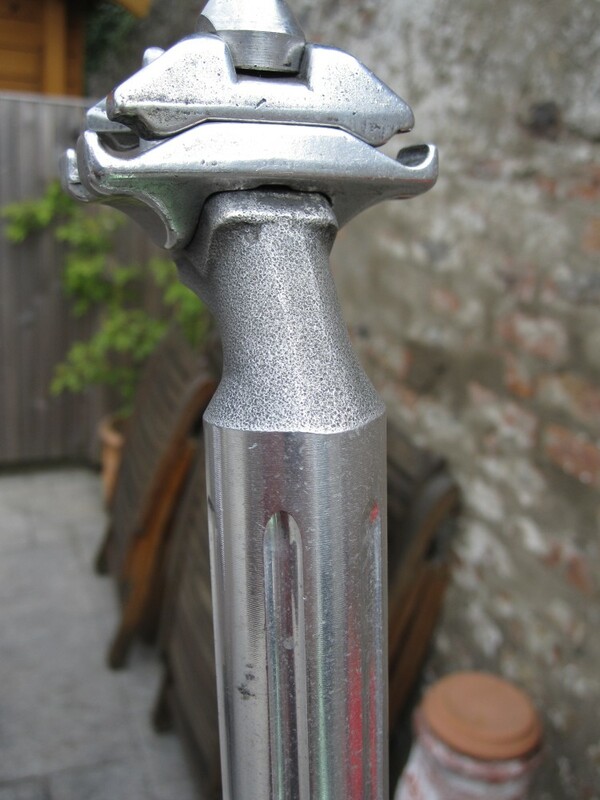 Seat Post : Simplex SLJ-6164 (French) 26.4 diameter. 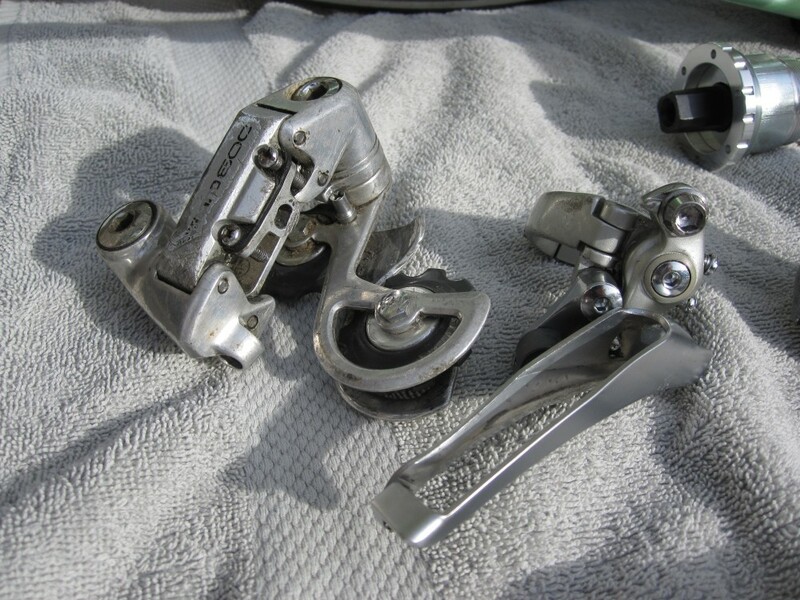 Front Mech/Derailleur : Shimano 105 7 speed (FD-1055, also stamped PC indicating March 1991 manufacture). Needed a narrow clamp on fit and this was available. This is not quite period correct, but it fitted, was available, reasonably cheap and actually looks very well on the bike. 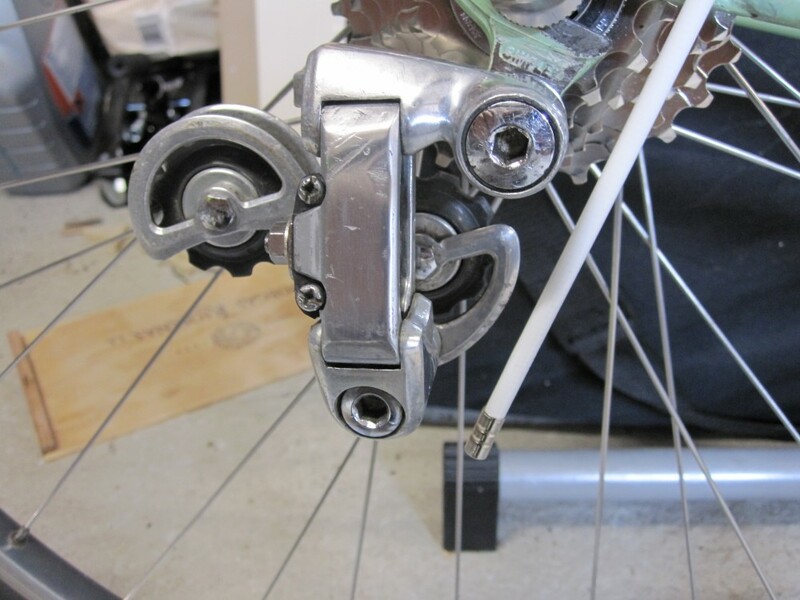 Rear Mech/Derailleur : Shimano 600 (RD-6207 from 1986 to 1988 period). It is a bit scruffy, but was bought as a temporary solution. However after some sanding and polishing, I am quite happy to stick with it. 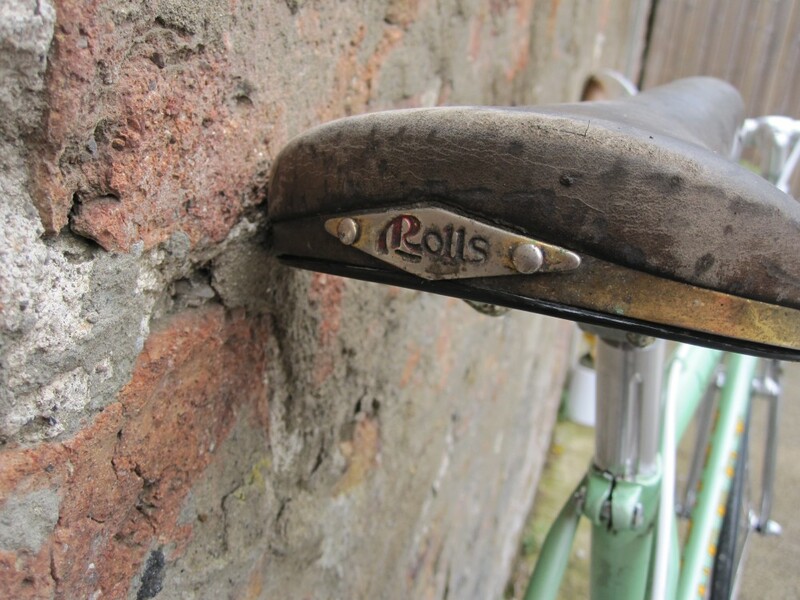 Saddle : San Marco "Rolls" (1989) - a birthday present from Ann sometime back in the nineties (had lived on my Alan bike since 1995 and is the only item cannibalised from that bike). Stem : Cinelli 1A (probably 1986/1987) from my old Viking Triomphe bike of the early nineties (it was replaced by a longer stem back in the nineties and remained in my parts bin since that time). 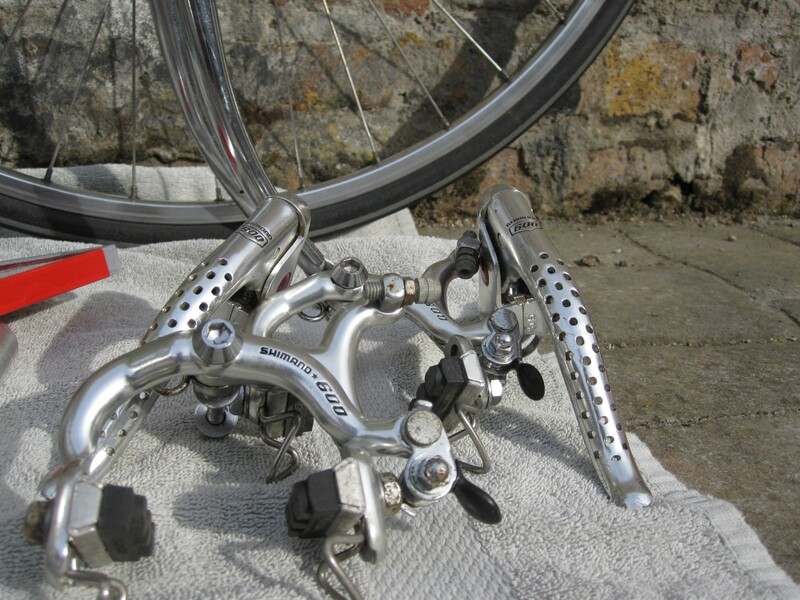 Pedals : Campagnolo pedals with toeclips (probably 1986/1987) from my old Viking Triomphe bike - These are Campagnolo 905/000Triomphe Pedals. Tyres : Continental Gatorskins 700x23. These are not even retro style, but I had a "very little worn" set lying around. So I have used them to "get up and running". I may replace them with some retro style, or more likely a set of plain(ish) black Michelin tyres as it being a French bike it probably should have French tyres and not German ones. 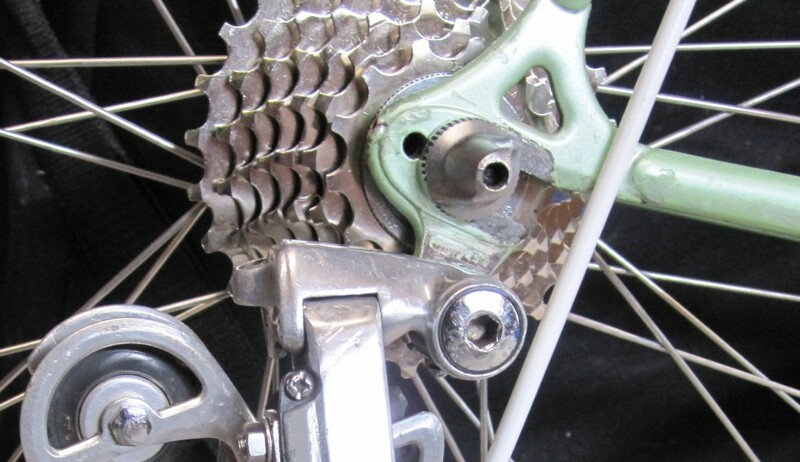 Cassette : (ChainReactionCycles) New Shimano 8 speed Hyperglide 13-26 with the 14 cog removed to make 7 speed. Fits the hub perfectly and as I'm using friction levers, shifting should be good. 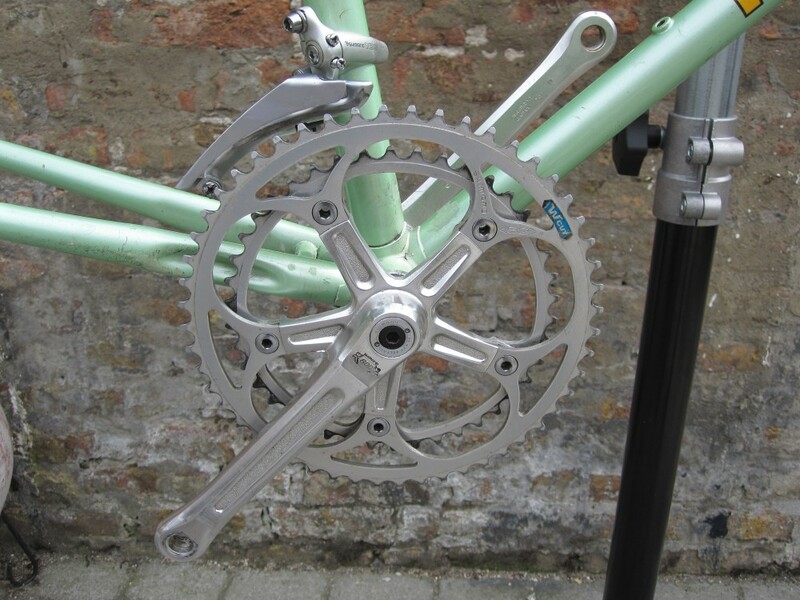 Chain : (ChainReactionCycles) New SRAM 8 speed chain (compatible with 7 speed). 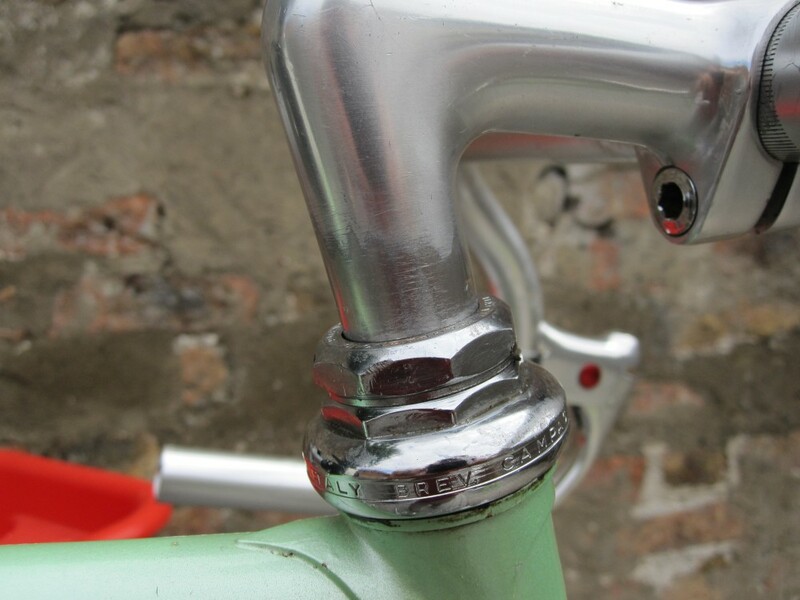 Handlebar Tape : (ChainReactionCycles) Deda Elementi Mistral - White. 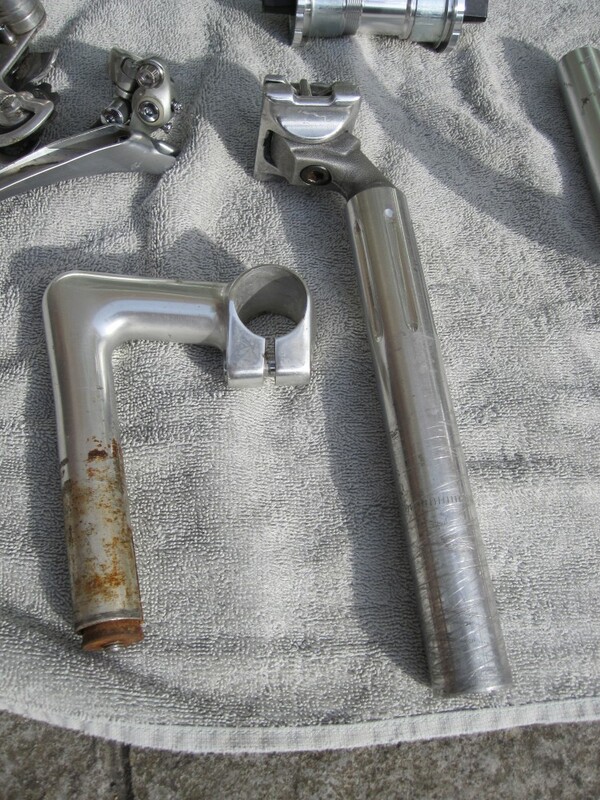 Brake Lever Hoods : (SJS Cycles) Dia Compe 202/204 hoods (not a great fit on 600 brakes - but good enough). 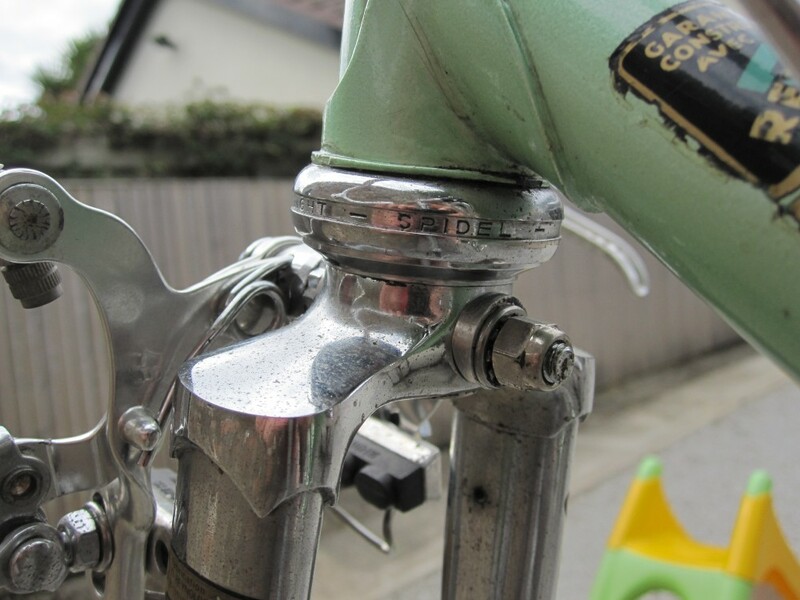 Headset : Top - Campagnolo (not sure what model); Bottom - Stronglight Spidel. Came with the frame and have not opened it. Seems to be functioning ok.